Thursday, June 25, 2009 - Students returned textbooks and we discussed this years work in science. Wednesday, June 24, 2009 - Classes played the Water Cycle game and Weather Bingo. We reviewed the lessons on AIDS. Tuesday, June 23, 2009 - Classes continued to review lessons from the Weather Watch unit by playing Weather Bingo with Mrs. Vallarella. Mr. Grambo was working the seventh Grade Buddy and Me Carnival in the schoolyard. The eighth graders had their prom at night at Bruno's on the Boulevard. Monday, June 22, 2009 - To review our work on weather, today we played a game of Weather Bingo. In this game, students answer weather based questions to then cover answers on their Bingo card. Winners walked away with computer software. The eighth grade had their Awards Assembly in the afternoon. Friday, June 19, 2009 - We played the Water Cycle Game. Everyone was a water drop or Water Molecule. We rolled a die and moved about the hall from place to place to see how water moves throughout the cycle. Most of the time the children found themselves in the ocean. Sometimes we got stuck as groundwater and even frozen for thousands of years in a glacier. We received a homework reading on Weather. Thursday, June 18, 2009 - We went over the Water Cycle and then talked about where scientists thought the HIV virus first occurred. The class was given a reading for homework on this topic. Wednesday, June 17, 2009 - There was a discussion on AIDS and HIV. Tuesday, June 16, 2009 - Mr. Grambo went with the eighth Grade on their Senior Trip to Holiday Hills in Connecticut. Mrs. Vallarella worked on page 160 of Bob and gave the reading on HIV and AIDS. Monday, June 15, 2009 - We experimented with transpiration and explained why we perspire. We gave out a homework reading on AIDS and HIV. This reading explains what the virus and disease are. Thursday, June 11, 2009 - We talked about the Water Cycle today and received a homework reading on the Water Cycle. 6-235 was on a trip today. Wednesday, June 10, 2009 - We continued talking about gasses in our atmosphere with the classes that did not have science yesterday. Today, 6-419 was on a trip. Tuesday, June 9, 2009 - Some students were asking about the gasses that made up the 1% of our atmosphere. We used a tesla coil to excite molecules of gas and made them glow. Different gasses glow in different colors. Today was a half day. We did not see 6-419 today. Monday, June 8, 2009 - We went over the answers to the Quiz from Friday. Friday, June 5, 2009 - Everyone took a quiz on weather. On this quiz you needed to prove air has mass and explain why the soda can crushed after you removed the air from inside the can. There were questions about what makes up the air and questions about the atmosphere. This quiz will be attached to page 156 of Bob when it is returned to you. The Black and White dance was this afternoon. Over 300 students attended the dance. The older AV (Local Crew) students were there, but the younger students set up and ran the dance. I think they did a wonderful job. Thursday, June 4, 2009 - This is Brooklyn/Queens Day and there was no school for students. Teachers went to meetings all day. Most of our science teachers learned about a new mobile science cart that our school just received. Mr. Grambo and Mrs. Vallarella went to a meeting at the Bronx Zoo. Wednesday, June 3, 2009 - We began to discuss the water cycle today. We know how water gets into the air and how it can be squeezed out. We learned how clouds form. As precipitation falls, where does it go? We discussed water on the surface of the earth and water below the surface. On Friday there will be a Quiz on weather. Tuesday, June 2, 2009 - We worked today on finding the names of clouds on page 153 of Bob and we worked on Cloud Cover for page 154 of Bob. All classes have had their Sally notebooks collected and graded. Monday, June 1, 2009 - Most classes that came in today were working on page 153 of Bob. We were finding out about the different types of clouds and where they are located (in terms of height) in our atmosphere. 6-326 came in today and made a cloud in a bottle. Our dance is this Friday and Mr. Grambo and Mrs. Vallarella went shopping for the dance during periods 1, 2 and 3. The Tree and Leaf project was due today. All classes had their Sally books collected and graded today. We also looked at the My Piece of the Neighborhood Project. Friday, May 29, 2009 - Some classes worked on the experiment dealing with humidity while others made a cloud in a bottle, yes a cloud in a bottle. We added smoke and a touch of water to a cleaned out 2 liter bottle. After putting the cap on the bottle we squeezed it and then let go. As we squeezed we increased pressure causing heat. The water evaporated into the air inside the bottle. As we let go the air cooled a bit causing the water to fall out of the spaces between the pieces of water. A cloud was formed. We received Site Visit 28 today and all the worksheets for Investigation 7, 8 and 9. Over the weekend we are to set up these investigations in our Bob notebook and make our last site visit. Thursday, May 28, 2009 - In today's experiment we wanted to find out how much water was in the air. We wanted the Relative HUMIDITY. To do this we needed two thermometers. One had a paper towel rubber banded to the bulb on the thermometer. This towel was then wet. Using the difference between the temperatures and a chart on page 150 of Bob we were able to show the humidity. This evening was the performance of our school play "the Audition". Wednesday, May 27, 2009 - We continued with investigation 6. After finding out about carrying capacity, we wanted to find out how water could get into the air. If we put water on the floor it would evaporate and go into the air. What if you moved the air molecules together? Would the water fall out of the air? If it did, what would it look like as it fell out? We discovered answers to these questions in our experiment on page 148 of Bob about Dew Point. Tuesday, May 26, 2009 - We began Investigation 6 today. We talked about how a drinking glass can only hold so much water. If you add more it will overflow. A sponge, like the glass too can hold water once the air in the sponge has been squeezed out. And like the glass, it can be filled up and then leak or overflow. This is Carrying Capacity - How much STUFF another thing can hold. We finished up page 146 of Bob and wrote a summary onto page 147. Friday, May 22, 2009 - Mr. Grambo was not feeling well today and was not in school. Thursday, May 21, 2009 - Many students are still absent with flu like symptoms. It does not make sense to go on to Investigation 6. Since Sally is being collected next week, we continued to fix up the Sally notebook. Wednesday, May 20, 2009 - We continued working in Sally and identifying the leaves we attached to pages 112-115. Over 450 students were absent today. News 4 was at the school talking with staff about the flu outbreak. 6-416 received the reading on convection today along with site visit 27. Tuesday, May 19, 2009 - We worked in Sally on our notebooks today. Many students were out sick today with flu like symptoms. We decided not to start on investigation 6 and to glue in leaves and finish weather data for the projects that we started in our journals. We will see what tomorrow brings in terms of student attendance. Sunday, May 17, 2009 - All teams went on their shuttle mission today. Some members of our team were on the shuttle itself. Others were part of mission control. In the simulator we had to lift off and send the shuttle into orbit. One member of our crew went into the Canada Arm and was lifted up to fix a broken satellite, while others performed science experiments on the lower deck of the shuttle. It was terrific and every member of all teams had a great time. In the afternoon we graduated from Space Camp receiving certificates and award ribbons. In the evening we watched two great space movies. Apollo 13 and Space Camp. We ordered in Pizza for dinner. Friday, May 15, 2009 - Greetings from Space Camp CANADA. We left school today on a coach bus headed for Montreal, Canada. We stopped two times during our 8 hour bus trek to the North. Once was for lunch and the other was at the boarder. Two guards boarded the bus and look over everyone's Passport. This year the boarder crossing did not take too much time. Last year everyone had to get off the bus and they went through everything. We had an orientation when we arrived and our classmates began some of the workshops for this years event. At 9:00 pm we had a snack (reallyyyy great oatmeal raisin cookies) and it was off to bed. Tomorrow is a big day with a lot of work in store for us. Thursday, May 14,2009 - We worked on page 144 of Bob today. On this page we wrote down what we learned about Conduction, Radiation and Convection from Investigations 4 and 5. We also needed to write down what we thought density was. After this we traded Sally books with a neighbor and went over their notebooks. We made a checklist of things that needed to be looked at over the weekend before the book was collected next week. Tomorrow Mr. Y and Mr. Grambo are off to space Camp in Canada with 49 children from our school. Wednesday, May 13, 2009 - Since Warm air floats on cooer air, I wonder if we can make layers of hot and cold water. We dyed hot water red and cold water blue. Students came up to try and make layers in the straw tower with these two liquids. The Book Fair ended today and the Spring Concert was this evening. Tuesday, May 12, 2009 - We continued to use the convection box to talk about how warm air rises above cooler air and how Density plays a part in all of this. Monday, May 11, 2009 - We went over last weeks work on density and began to talk about convection. First we talked about the three things needed for fire (fuel, heat and oxygen). We then experimented by covering a lit candle with a 250 mL beaker. When the air supply was exhausted, the fire went out. Our convection box was in a way similar to the beaker. It was enclosed and had a lit candle inside. There was , however, two holes in the top and one of them was over the candle. Air above the candle gained energy and pieced moved away from each other. This made the air above the candle less dense. This less dense (and warm) air began to rise. Cooler, more dense, air began to come in through the other hole to feed oxygen to the fire. We added a bit of smoke from incense to allow us to see what was happening. Today we worked in Bob on pages 140 and 141. Friday, May 8, 2009 - The Plant Sale was still going on today. We received a reading on Clouds today. We were supposed to work on the reading and give it in to the teacher. Thursday, May 7, 2009 - Mr. Grambo was working at the plant sale. All the classes received the worksheets for investigation 6 and were setting up their bob notebooks for this investigation.This investigation is on Humidity and Clouds. Wednesday, May 6, 2009 - We finished making layers with the different densities of salt water. The most dense solution was on bottom and the least dense was on top. The plants for our Plant sale arrived at 2:00 in the afternoon. 60416 set up the classroom for the Mothers Day Plant Sale sponsored by our schools 4-H club. Tuesday, May 5, 2009 - We are continuing with our experimentation on density and solution concentrations. We will be working on this experiment until Wednesday. Monday, May 4, 2009 - We are starting to build a tower of salt water. The tower is made of solutions of varying concentrations of salt. We are adding food color to the solutions. The tower will show four distinct layers. There are no instructions for this experiment. Everyone is only given a description of what they must find out. Everyone's job is to figure out how to achieve the goal. Friday, May 1, 2009 - Did you know that you can force an object to float that normally would sink? Well we put an egg into fresh water and it sinks. We then began to add salt to the water and in a bit of time the egg was floating around. We did not change the egg, so the salt must have changed the water. Salt turned into tiny pieces that began to fit between the spaces of the water molecules. The salt put more pieces in the same volume of water and changed the water's DENSITY. The water became more dense and the egg was able to float. This experiment is as the top of page 138 in Bob. Sitevisit 25 in Sally for our My Piece of the Neighborhood Project has us writing a Haiku Poem. Thursday, April 30, 2009 - Today was Hawaii Day at school and our Hawaii Dance was this afternoon from 3:30 to 6:30. In school classes were working on our density experiment. A few classes need to go back to Investigation 4 and work on their Graph for the radiation part of the experiment. Tomorrow we will talk about sinking and floating. Wednesday, April 29, 2009 - Some classes were working on the graph for the Radiation experiment. Others were working on finding the density of a brass cylinder and a wood cylinder. During the day I ran over to BJ's to get stuff for tomorrows dance. Tuesday, April 28, 2009 - We continued our discussion of conduction and how heat (or electricity) travels through an object away from the heat source. This explains how the handle of a heating pot gets warm. We wet to the hallway to Talk about our school's Expansion Joint. This spot allows the building to expand when it absorbs heat from the sun. We are again having our notebooks collected. We are looking at Investigation 4 and the set up for 5. Monday, April 27, 2009 - We discussed our Tree and Leaf project and the requirements for it. This project involved collecting leaves from 10 trees and is due on June 1, 2009. We then worked on the demonstration on page 136 of Bob. We had cards attached to a metal rod using wax. The end of the rod was headed as we watched the wax melt and the cards fall off the rod. Again we discussed conduction. Our school Talent Show was this evening. Friday, April 24, 2009 - We begin work on or Tree and Leaf project today. It is due on June 1, 2009 (Five weeks from now.) In class, a table was set up with books for leaf identification. Sample pieces of trees, for Bark Rubbings and ring counting, were also on the table. We received Site Visit 24 for Sally and received our papers for next weeks Investigation 5. In class we finished Investigation 4. Mr. Blum and Mr. Akalski planted two trees in our School Lew McNeece Memorial Garden. These trees were part of our Earth Week celebration and were planted on Arbor Day. Thursday, April 23, 2009 - We continued working on Investigation 4. Mrs. Hayden came in during period 3 (when 6-326 was there) to observe how Mrs. Vallarella and Mr. Grambo teach. In the evening we gave out the awards for the winners of this years Science Fair. These awards were given out during the PTA Meeting. Wednesday, April 22, 2009 - Today is EARTH DAY Every class in grade 6 went to see the Disney movie EARTH. We start this movie following a pair of two month old Polar Bear cubs crawl out of their den in search of shelter while dad searches for food. There is a Mandarin Duck falling from a tree and Caribou (lots of Caribou) walking across the tundra. We even witnessed a wolf chasing and attacking a Caribou calf. Next year Disney is putting out Oceans on Earth Day. Tuesday, April 21, 2009 - 6-419 and 6-235 started work on Investigation 4. All other classed continued working on this experiment. We will begin our Tree And Leaf project this week. It will be due on June 1, 2009. We collected change today for donation in an event called Change the World. Monday, April 20, 2009 - We started on Investigation 4 today. Our goal is to find out how heat travels. Part of this investigation involves radiation and part involves conduction. Students designed the experiment based on the type of data they needed to collect. With conduction dark soil, sand, water and air were exposed to a heat lamp. A start temperature was attained and then readings were taken every two minutes for ten minutes. After this the lamp was turned off and readings continued to be taken. Which heated up fastest and which cooled off first? Conduction explains how a pot handle gets hot. How does the heat travel from the bottom of the pot up the sides and to the handle? We try to understand this in the conduction part of this experiment. Mr. Grambo was also helping Mr. Y set up the practical part of the eighth grade science exam. Their test starts tomorrow. Thursday, April 9, 2009 through Sunday, April 19, 2009 - School is closed for Sprig Recess. Work on Site Visits 22 and 23. Wednesday, April 8, 2009 - Everyone received a reading on how heat travels through radiation, conduction and convection. This reading is for background on Investigation 4. We also received Site visits 22 and 23 for My Piece of the Neighborhood. During vacation we need to write 5 changes we noticed about our site since we started our study and we need to cut and attach a bud from a tree on or near our study site. Tuesday, April 7, 2009 - Classes that did not have science on Monday finished up Investigation 3 and received worksheets for Investigation 4. 6-323 set up their Sally notebooks for the upcoming Tree and Leaf Project. Monday, April 6, 2009 - We made sure that Investigation 3 was finished and that pages 124-128 were completely written out in our Bob notebooks. We received the worksheets for Investigation 4 and glued them into our Bob notebooks. Friday, April 3, 2009 - Everyone has finished Investigation 3 - Seasons. We will set up for Investigation 4 on Monday and Tuesday. Today was the end of the Third Marking Period. Two progress reports and a follow up letter were sent out this marking period. The Fifth Graders returned from their overnight trip to the New York Hall of Science. Thursday, April 2, 2009 - We started an experiment today that will help us realize why the earth gets heated differently by the sun depending on where you stand on the earth. Because of the earths tilt, there is land on the earth that curves away from the sun. Other land gets a direct hit of light and heat from the sun. This experiment begins on page 124 of Bob and will take a few days to complete. The fifth graders are going on their overnight trip to the New York Hall of Science today after school. Wednesday, April 1, 2009 - Mr. Grambo was not in school today, however, Mrs Vallarella worked with 6-326 and 6-419 to develop the graph on page 123 of Bob. The homework on climate and seasons was collected. Monday, March 30, 2009 - We started on Investigation 3 - Seasons and Climate. We worked on page 123 of Bob today and learned to find the length of the day when we know the sunrise and sunset times. We then plot a graph showing how the length of the day changes from month to month throughout the year. We were given a reading on seasons (this will go onto page 122 of Bob once it is graded). Friday, March 27, 2009 - Everyone has finished Investigation 2. Bob notebooks are being collected and Investigation 2 is being checked. We went home with all the materials to set up our Bob notebook for investigation 3 and our Sally notebook for site visit 20. The Third Marking Period ends next Friday, April 3. Thursday, March 26, 2009 - All classes have now finished the experiment on pages 116 and 117 of Bob. We can now begin to give air attributes. We can say and prove that air has mass, takes up space and can press down on things. Air is a substance. It is something. Wednesday, March 25, 2009 - 6-416 has finished investigation 2. Their Bob notebooks were collected and graded today. 6-235 had many students in the show today. The class worked on fixing up their notebooks (most students were not in class.) All classes have gone to the Science Fair. All classes have finished the Air Pressure experiments. Tuesday, March 24, 2009 - The second floor classes went to the African American History show in the auditorium this morning. Classes today were crushing cans, using air pressure, and also spent 1/2 a period investigating the Science Fair. Monday, March 23, 2009 - Most classes were crushing the aluminum soda can using air pressure. During each period we spent some time at the Science Fair. We completed a Scavenger Hunt worksheet at the fair. This sheet will be attached to page 41 of Jake. These are two really great Air Pressure Videos on You Tube. 2-Soda cans get crushed by removing air from inside the cans. This video has great explanations. Friday, March 20, 2009 - The second and third floor classes were on a trip today. The fourth floor classes were finding out if air has pressure. We removed air from inside a soda can by heating the can. The hot air inside the can rose up out of the hole in the top of the can. We then sealed the can by touching the opening of the can to a container of water. Once air could no longer go back inside the can, the outside air smashed the can. Thursday, March 19, 2009 - All classes today worked on words that needed to be added to your Glossary for Investigations 1, 2 and 3 on Weather Watch. Mr. Grambo was not in class today. He was working with Mr. Yaskulski to set up the Science Fair in the library. Parents came in to view the fair at about 7:30 pm. All classes will view the fair sometime next week. Wednesday, March 18, 2009 - We have proved with the balloon and triple beam balance that air has mass. The cup, piece of paper and tank of water proved that air takes up space. Air is something. Today we began to prove that air can push on things. We are doing this with a soda can. Tuesday, March 17, 2009 - Today was wear GREEN day. We also began to experiment to find out if air is something. We put a paper inside a glass turned it over and submerged the open end into a tank of water. The paper came out dry. What kept the water from entering the cup and wetting the paper? in another experiment we weighed an empty and then air filled balloon. Does air take up space? Does air have mass? Is air something? Monday, March 16, 2009 - A note was sent home with students that were missing a great deal of work. The Marking Period ends in a few weeks and we need to get all our work in. We began experimenting to see what air is and if it has any properties. This experiment begins on page 116 of Bob. The Book Swap began today in the Library. Bring in books to trade in for different books. The Book Swap - Our school book recycling program. Friday, March 13, 2009 - Classes were finishing up their Atmosphere Charts on page 114 of Bob. This weekend Site Visit 18 of My Piece of the Neighborhood asks us about Daylight Savings Time. Thursday, March 12, 2009 - Classes finished developing a pie chart to show the composition of air. We then moved on to the atmosphere and its parts. We are now developing our own atmosphere chart on page 114 of Bob. Wednesday, March 11, 2009 - Today was the second day of the Math Test. 6-235 and 6-326 did not have science today because of the math exam. We explained the book report project to 6-419. 6-416 began work on Investigation 2 - What is air. The worked on the pie chart on page 112 of Bob. Tuesday, March 10, 2009 - This was the first day on the City Wide Math Test (given during periods 1 and 2). In 6-419 we viewed a few last projects and in the other classes we handed out the form for the Environmental Science Book Report. Monday, March 9, 2009 - We finished viewing all science fair projects with presentations from Team 3. We received our workbooks for our Environmental Science Book Report which is due on April 2, 2009. We put a reminder sticker into our planner on the date of March 30. Friday, March 6, 2009 - We viewed projects from Teams 4 and 5 today. We also started to spot check both the Sally notebook and the Bob notebook. We can ask any team to hand them in at any time. Monday is going to be our last day for viewing projects. We have to see the rest of the projects from Team 3. Thursday, March 5, 2009 - We viewed Science Fair Projects from Teams 6 and 4 today. We also gave out Site Visit 17 for our My Piece of the Neighborhood Project. We want you to find and print out a set of directions that will get you from your study site to the school. Also, when observing your site this weekend, take note of the temperature, melting snow and the plant life that may be waking up and growing. Wednesday, March 4, 2009 - In some classes today we viewed the projects from Team 2. In other classes we viewed the projects from Team 6. We should be finished Viewing all projects by Monday. Some students need to have their Sally book re-graded. Please review your book and re-submit it for a new grade. Tuesday, March 3, 2009 - We looked at the projects from Team 2 at three of our classes. The other two classes do not have science on Tuesday. The projects from team 2 in those classes will be looked at tomorrow. Today is Square Root Day - 3-3-09. 3 X 3 = 9 The square root of 9 is 3. Monday, March 2, 2009 - Over the past weekend, the weather people were predicting snowfall for the New York area that would begin around 7:00 PM on Sunday evening. On Monday morning there was ten inches of snow on the ground by 5:00 AM. Chancellor Klein went onto Channel 7 news at 6:00 and cancelled school. This is the first time in five years. We will look at the rest of Team Threes projects on Monday, March 9, 2009. Tomorrow (Tuesday, 3/3/09) we will look at the projects from team 2. Follow the schedule posted in your Jake Notebook and below on February 23, 2009. Wednesday, February 25, 2009 - All classes were presenting their Science Fair Projects. Today was the first full day of presentations. 6-235 and 60419 had presentations from Team 1. The other classes had presentations from Team 5. Tuesday, February 24, 2009 - 6-235 and 6-419 received their presentation schedule. 6-323 started presenting their Science Fair Projects. Remember that we collect and grade your Jake book along with your project. 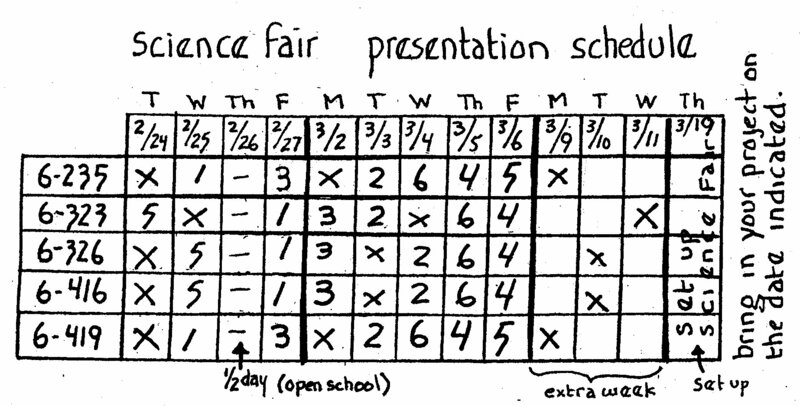 Monday, February 23, 2009 - We began to give out the schedule for Science Fair presentations. Mrs. Vallarella and Mr. Grambo then presented a project to the class. Everyone graded the presentation and project according to the rubric on page 8 of Jake. We discussed the way presentations will be held and what to expect. Mr. Delvalle was in the room while 6-323 was present. Friday, February 13, 2009 - We wrote a weather report onto page 110 of Bob. This weather report was to be a 1/2 page speech that a weather person would give to the public for today's weather. Al Sally notebooks were collected and graded this week. We looked at the project on the Moon and looked at your progress on your My Piece of the Neighborhood Project. We were looking at your site visit entries. Thursday, February 12, 2009 - We finished plotting Hurricane Dean and talked about how we just did one of the jobs a meteorologist does. We discussed what a meteorologist is and what they do. We worked then put this information onto page 111 of bob. We had our Valentine Dance today from 3:30 to 6:30. Wednesday, February 11, 2009 - We continued plotting the path of Hurricane Dean (August 2007) onto the NOAA Tracking Chart on page 108 and 109 of Bob. We needed to show how to distinguish between a tropical depression, storm and the five categories of hurricane when plotting points on the map. We used the internet to help us see how this has been done in the past. We are not to reinvent the wheel. We need to find out how Meteorologists around the world do this so that we can plot points in a similar way. We received our Second Marking Period Report cards today.Open School meetings are on February 26. Tuesday, February 10, 2009 - We talked about Hurricanes, how they form and why they are dangerous. They begin over warm water (70 to 80 degrees farenheit) The water evaporates and rises to form clouds. The clouds gather and begin to spin because of the trade winds. A tropical depression is formed. When plotting points on a chart, how do you indicate the difference between a starting storm (a tropical depression) and a full blown hurricane. Students searched the internet for answers today. At this time all classes received Progress Report number 4. This report is for the beginning of the third marking period. Monday, February 9, 2009 - Today our classes went to the Auditorium to venture into the Discovery Dome. In the dome we viewed a 360 degree, all around us movie about the earth called Earths Wild Ride. In this movie we saw the destruction of dinosaur life by a giant asteroid and the birth of the atmosphere. 6-416 and 6-326 started to plot the course of Hurricane Dean onto page 108 and 109 of Bob. Our Valentine Dance is on Thursday, after school. Thursday, February 5, 2009 - We went to Mr. Blum's room to see two videos on weather, One was called things that fall from the sky. The other was on hurricanes, We answered questions about the video on page 105 of Bob. We received a homework reading on hurricanes as we left the classroom. You can review these videos at our Weather Watch web pages. Wednesday, February 4, 2009 - Today we came up with a definition for weather using the think/pair/share method. On page 89 of Bob we ended our unit of Simple Machines by writing down what we learned about Inclined Planes and Simple Machiles. We then went back to the KWL Charts on page 27 and 85 and filled in the L(Learned)part. All Bob notebooks have now been collected and graded. Tuesday, February 3, 2009 - Everyone now has their notebooks set up for Weather Watch. All classes received a reading on Weather and a reading on Ground Hog Day. 6-235, 6-416 and 6-419 had their Bob notebooks collected today. 6-323 began work on weather. They filled out the KWL chart on page 103 and made the class definition for the word weather. All classes in the school will take part in a presentation on Internet Protocol from the 115 Police Precinct this week. Monday, February 2, 2009 - The Third Floor classes set up their notebooks today for weather watch. You can view our web pages on Weather at: http://www.armstrong227q.com/Science/WeatherWatch/index.htmIn all our classes we discussed Ground Hog Day and received a reading on Ground Hog Day. We are ready to start on Weather. The Third Floor classes had their Bob Notebooks collected and graded today. The third floor classes were on a trip today and will set up their notebooks next week. Everyone received a Reading Homework on weather and Site Visit number 13. We will be collecting weather data for our site for the next few weeks. Thursday, January 29, 2009 - Everyone took the Quiz on Simple Machines. There was a question on math related to Work. There were some definitions. We had to make drawings of Pulley Systems and had to use data we collected from the Inclined Planes experiment to prove something. Tomorrow we will set up our notebooks for Investigation 1 in our unit of study on weather. Wednesday, January 28, 2009 - 6-235 went over the Pythagorean Theorem and has finally finished the work on Simple Machines. All other classes finished up missing work. Everyone is ready for the Quiz on Thursday. This quiz is on Simple Machines. We will begin our study of Weather on Friday. Tuesday, January 27, 2009 - We printed extra copies of all work that has been done for the third marking period. Students spent time finishing up all this work so it can be handed in. Mr. Grambo began to print the Weather Experiments. We will set up our Bob Notebooks for Weather Investigation 1 on Friday. So far, Open School is scheduled for after the February break on February 26. Check the school calendar for any possible changes. Monday, January 26, 2009 - We are finishing up our unit of study on Simple Machines. We worked on a Crossword Puzzle about machines. Some students still have work to hand in. The report cards will be printed soon and they will indicate the missing work as the progress reports did. The missing work does not just go away. Friday, January 23, 2009 - We went over the Jake notebook and all the pieces that you have to put into it. At this point, everyone should have page 7 checked and should be starting their project. We received a homework reading on the phases of the moon. We need to take a photograph of our sit for visit number 12. Thursday, January 22, 2009 - Today, 6-235 and 6-323 did not have science. They were taking part 2 of the ELA test during periods 1 and 2. All other classes went over the assignment on the Pythagorean Theorem. We then went onto doing a reading on the screw and wedge; two other simple machines. We put a sticker in our planner that reminds us that we received two progress reports this marking period that needed to be signed and returned to class. All students at this time should have had their science fair project idea reviewed and have page 7 of Jake signed by an adult. Wednesday, January 21, 2009 - This morning the sixth grade took the first part of their ELA exam. We did not see 6-235 and 6-326. In the afternoon the classes talked about pythagoras and his theories, Everyone was asked to work on one of his math problems to find the missing length of a side of a right triangle if you know the length of the other two sides. This math is called the Pythagorean Theorem. Tuesday, January 20, 2009 - The entire school had the chance to observe the inauguration of President Barack Obama. The 5th grade and 4th floor sixth grade went to ELMCORE. Others observed the festivities in the auditorium, lunchroom or one of the other areas set up around the school building. In the afternoon 6-419 came to class and worked on a reading about the screw and wedge. Monday, January 19, 2009 - School was closed today in observance of the Birthday of Dr. Martin Luther King Jr.
Friday, January 16, 2009 - We collected all missing work indicated on our progress report. As the class finished work with the Inclined Planes, Mr. Grambo and Mrs. Vallarella went around the room looking at Science Fair Ideas (Jake pages 1, 2 and 7) an d grading any work that was glued into the books before being looked at. We received two sheets on Energy today (Bob pages 100 and 101). We also received our word for My Piece of the neighborhood (Visit 11) and a reading on Inclined Planes. Thursday, - January 15, 2009 - We continued with our work on Inclined Planes. The thing that we changed in this experiment was the height of one side of the ramp. On page 88 of Bob we indicated that height as well as the length we pulled the load. We measured the force needed to move the load up the ramp with the spring scale and then made a protractor to measure the angle of the incline. We call our protractor an Incline-O-Meter. Tomorrow is the last day of the second marking period. We received progress reports last Friday. Wednesday, January 14, 2009 - We talked about projects we could and should not do. The project must be the result of an experiment. This makes volcanoes and planets out. We discussed independent variables, dependent variables and controlled variables again. In the evening we held our second open house of the year. Parents of students that might apply for our school came in to check us out. Friday you need to have a single project idea for the science fair. We will check pages 1, 2 and 7 of Jake on Friday. Tuesday, January 13, 2009 - 6-235 and 6-419 watched the Janice Van Cleve Science Fair Video. In all other classes we talked about projects you can't do, like the volcano, alarm system, dream house and the Planets. Keep Mom and Dad from taking over and doing the project for you. You must have your project idea picked out by Friday. We will check pages 1,2 and 7 on Friday. Monday, January 12, 2009 - We watched the Janice Van Cleve video on Science Fair Projects and recorded information on page 40 of Jake. We talked about what is expected of us and that the project must be an experiment. Friday, January 9, 2009 - Today we started our Science Fair Project by putting together our Jake notebook. In Jake we will keep track of our 8 week experimentation and presentation process. We also received our third progress report. The second marking period ends in about two weeks. It is time to get all missing work handed in for a grade. This weekend will be our tenth entry for My Piece of the Neighborhood. We are writing a poem using similes. Oh and by the way, tomorrow is our Full Moon. Thursday, January 8, 2009 - We put a sticker in our planner to remind us to bring in a book to use for Jake and to bring in Elmer's glue. We collected missing work and continued working on our experimentation with inclined planes. We received a homework reading on Pythagoras. Wednesday, January 7, 2009 - Students were given the opportunity to see what work they were missing and to obtain the missing worksheets. This work is to be handed in on Thursday. Progress reports will be given out on Friday. We will be putting together our "Jake" Science Fair Journal on Friday. Please number pages 1 through 50. Classes continued working on the Inclined Plane experiment. Tuesday, January 6, 2009 - The classes that did not have science on Monday, followed the Monday listing. 6-323 continued working on the Inclined Plane experiment. Wednesday, December 24, 2008 - Sunday, January 4, 2009 - School closed for Winter Recess - Students are to beginning their project on the moon January 1, 2009. You are to draw a picture of the moon each day for the month of January. For seven days you are to keep track of weather data for site visit number 9. Tuesday, December 23, 2008 - We went over the Moon Project and we looked over site visit 9 for My Piece of the Neighborhood. We have to keep track of Weather Data for seven days during vacation. Monday, December 22, 2008 - Mr. Grambo and Mr. Levin took the AV Squad to NBC Studios today for a tour. The class was given an assignment on Mars Rovers. The story was read to the class while they took notes. They then could only use these notes to answer the questions. We are practicing science readings for the upcoming ELA. The Holiday Dance was this evening. Friday, December 19, 2008 - It snowed today so our Holiday Dance was moved to Monday, December 22. Our classes set up the Bob notebook for an experiment on Inclined Planes (ramps). We received site visit sheet 8 for Sally and a reading on the snowstorm. Thursday, December 18, 2008 - This morning everyone took the Math Acuity test during periods 1 and 2. Other classes went over how to find weather information on the internet. The Holiday dance has been rescheduled for Monday, December 22, 2008. We are afraid of snow for tomorrow. Wednesday, December 17, 2008 - After Breakfast, we packed down and brought our bags back to the lodge. Everyone went on their morning activity which included hikes. It had snowed the night before, so it was a bit slippery. We ate lunch and got on the bus to return to 227 at 2:00 PM. We arrived back to school at 4:00 PM. The work left for all classes was a reading on Pulleys. Tuesday, December 16, 2008 - We woke up at Taconic and went on a morning hike around the lake at 7:00 AM. After the breakfast at 8:00 AM. it was off to Project Adventure. This was a team building set of obstacle courses. Each group participated in at least three activities. In the afternoon we learned about nature drawing and we worked in our journals. In the evening we had another nature program where we saw snakes a reallllly big snapping turtle, a Macaw, and a gigantic snake. At night we played a game called Dutch Auction. We would ask for items like a battery or flashlight. Points were given for items that each team had. At our classroom back at school, children worked on The Simple Machines Math Worksheet. Monday, December 15, 2008 - We went on our overnight adventure to Taconic and Stoney Kill Farm today. We arrived at school at 6:00 AM. Our luggage was put under our Tour Busses and we were on our way by 7:00 AM. We arrived at Stoney Kill Farm at 10:00 AM. There were four projects done here. We went to the barn where we saw and fed chickens, sheep, cows and pigs. In the greenhouse, we learned how to plant crops. The workshop had us learning how our environment can get polluted and how we have to speak up to make it stop. In the main lodge we learned how explorers mad foods from corn. We ate lunch and it was off to Taconic. Upon arrival, we unloaded the bus and the children went off for an orientation. The adults went to a circle to talk about logistics. We ate dinner had a bit of free time in our cabins and were treated to an animal show. We saw a red tail hawk, a turkey vulture, a small falcon, an American alligator and a lizard. Our classroom activity back at school was a simple machines math sheet. Friday, December 12, 2008 - Today we worked on predicting Cloud Cover for the weather information we gather in our Sally notebook. Each week we ask for weather information. Today we find out about cloud cover. Using two sheets of paper (one blue and one white) we folded and cut up the white paper into fractions of the whole piece. we then used our white cloud pieces to cover our blue sky. Did we use 25% of the white paper. 50%?. We did this on page 28 and 29 of Sally. We also received information that will help us set up our notebook for the January Moon Project. In this project we observe the moon for 31 days and keep track of data. There are four reading assignments and internet gathering exercises that will need to be done for this project.Homework has us finishing pages 28 and 29 of Sally and setting up the pages for the Moon Project. Thursday, December 11, 2008 - Today most classes tried to figure out how to make a two pulley system where both pulleys were fixed. One to the top rod on the ringstand, the other to the clamp that holds the ringstand to the table. We also talked about our upcoming Moon Project for January. We will get many sheets tomorrow to glue into Sally. The weekend project for My Piece of the Neighborhood will be about Cloud Cover. Wednesday, December 10, 2008 - The morning classes went to the auditorium to see the winter Concert. The music was terrific. The three teachers did a wonderful job with all the students. They played and sang so great. In the afternoon 6-419 had a group of assistant principals observing them. The classes in the afternoon were working on the two pulley system for simple machines. Tuesday, December 9, 2008 - Mr. Grambo was involved in the Community Concert. Seniors and the Little Children our seventh graders are involved with in C&C came to school to see our Band, Orchestra and Chorus in concert. Several Congress people and a senator were also in attendance. A word Search puzzle on Simple machines was given to all classes today. Word search puzzles help to increase your ability to recognize words and help to build spelling and vocabulary skills. On this word search we also ask you to identify three new words and to write down their definition. Friday, December 5, 2008 - Mr. Grambo was not in school today. We were given a reading on Archimedes, the Greek mathematician that worked extensively on Levers. He said that if he had a lever that was long enough he could move the Earth. Our weekend addition to our Sally journal was to make four sketches at our study site of the same object. We were to use contour methods and fast methods to make our sketches. Thursday, December 4, 2008 - Classes worked on the math that is behind our levers and pulleys. Yes Math I say. Mechanical Advantage, Work, Power and Efficiency. We talked about how math is part of everything we do and that we will use math in science to figure out things. Our homework was to finish the four math problems. Wednesday, December 3, 2008 - Everyone brought back their Progress report and Signed Test paper. Many students took the Quiz over again. 6-235 somehow skipped over the First Class Lever experiment. Next week we need to make sure that experiment is finished. Almost all classes are ready to begin experimentation using two pulleys in the same system. Will one be fixed while the other is free? Will both be free or will both be fixed? We will find out only through experimentation. Tuesday, December 2, 2008 - Classes that did not meet on Monday received their second progress report and resumed experimentation with a single pulley. Monday, December 1, 2008 - All classes finished their quiz on levers and all classes that met today received their second Progress Report. This report is to be signed by your parents and brought back to school. After it is checked for a signature, it will be attached to page 186 of Bob. We resumed our experimentation with a single pulley as a simple machine. Friday, November 28, 2008 - School is closed for Thanksgiving break. Wednesday, November 26, 2008 - All classes took their quiz on levers today. The weekend site visit for your My Piece of the Neighborhood project has you making a sketch of three items at your site. It also asks you to write about three changes in your site that you have noticed since you started this project. Tuesday, November 25, 2008 - 6-323 took their quiz on levers today. 6-235 finished up levers and the rest of the classes worked on the fixed and free pulley experiment. This weekend you will be making sketches at your study site for the My Piece of the Neighborhood project. Monday, November 24, 2008 - We continued working with a single pulley in a fixed and free system. We again talked about variables. There will be a Quiz on Levers during the next class session. We gave out a listing of items that belong in the glossary and index. Friday, November 21, 2008 - We started to work with the pulleys. With a single pulley, you can make a fixed system or free system. In a fixed system, the pulley is tied to the bar. A rope goes over the pulley wheel allowing the user to pull downward on a rope and move a load attached to the rope upward. I a free pulley system the pulley moves up and down with the load. This experiment begins on page 72 0f Bob. Homework this week involves drawing a map of your study site and a reading on maps for your My Piece of the Neighborhood project. Thursday, November 20, 2008 - Today we worked with some Egyptian pieces on loan from the museum. We looked at canoptic jars, amulets and Coffin Panels. Since the sixth grade is studying Ancient Egypt right now I thought it would be good to get first hand experiences with their art. We also have a collection of books on Ancient Egypt in our classroom library. This week we will be making a map of our study site for My Piece of the Neighborhood. Wednesday, November 19, 2008 - This morning we took the aquity test in Language Arts. There was a science reading on planting a tree that had 15 steps in the procedure. Classes wrapped up the lever experiment by writing what they learned about levers on page 70 of Bob. We then began pulleys with a KWL chart on page 71. We looked up pulleys on the internet and in various dictionaries. Monday, November 17, 2008 - Students worked to finish the Class 2 and 3 Lever experiment and make the line graph that helps to explain the data collected through experimentation. We also began to set up our Bob notebook for our upcoming Pulley Experiments. Tomorrow is Open School afternoon and evening. First Marking Period Report Cards were handed out at 3:00 today. Friday, November 14, 2008 - Today, we went over making the graph for the class 2 and 3 lever experiment. In the class two lever system, the spring scale showed an increase needed in effort to lift the load as we moved away from the fulcrum. The opposite effect was shown in the class 3 lever system. Everyone had their pictures taken for the lunch system computers today. This weekends homework was the bathroom book contract, the reading on the Wheel and Axle and pages 18-19 of Sally. In Sally our job this week is to write a poem. There is a reading on page 18 about what a poem is. Have fun with this. Thursday, November 13, 2008 - We continued working with Class 2 and 3 Lever systems. We needed to find the mass of our Load. To do this we used the Triple Beam Balance. All students will get a chance to use the balance. This piece of equipment will appear on the practical part of the 8th grade city wide science exam. We received a homework reading on class 3 levers. Wednesday, November 12, 2008 - We started working on our experiments with Class 2 and Class 3 Levers. In a Class 2 lever the Load is in the middle of the lever system. In a Class 3 Lever the Effort is in the middle. We also stopped to talk about variables including Independent and Dependent variables (check the sheet on page 62 of Bob). We received a Homework Reading on Class 2 levers. Monday, November 10, 2008 - We checked to see that everyone worked on their Sally book and finished site visit two, 6-323 and 6-416 had their Sally books collected and graded today. 6-419 will have their Sally book graded on Wednesday. We set up our notebooks for our next experiment on second and third class levers (pages 56-62 of Bob). We received a homework reading on Second Class Levers. This reading is due on Wednesday. Friday, November 7, 2008 - 6-326 had both Bob and Sally collected today. 6-416 finally worked on the Tug of War experiment and everyone else finished the lever experiment where we were moving around the effort. Thirty students have already given Mr. Blum their permission slips for the Taconic Trip. this weekend everyone need to make their second site visit for the My Piece of the Neighborhood Project, You need to collect two leaves from the same tree. Make sure they are different colors. Make a leaf rubbing and sketch of the same leaf. This work will go onto pages 16-17 of Sally. Thursday, November 6, 2008 - I looked over the Sally journals of 6-235 today. They did OK. Everyone needs to remember to put in the weather data for their site visit. Students began to work on the experiment on pages 48-52 of Bob. In this experiment you need to prove that if you keep the fulcrum and load in a constant position, that moving around the effort can make lifting the load easier or more difficult. We handed out the work for this weekends site visit. It will be on pages 16-17 of Sally. You need to collect two tree leaves for page 16. On page 17 you need to make a rubbing of one of the leaves and a sketch of the same leaf. Wednesday, November 5, 2008 - We looked at Sally to make sure we are ready for our book to be collected. We then continued on our work with levers. Classes are in different places in respect to our work. Some are on page 46 of Bob, while others are working on the experiment starting on page 48 of Bob. We are trying to prove that if the effort is closer to the fulcrum it more difficult to lift an object. Tuesday, November 4, 2008 - This was Election Day and Students were not in school today. Mr. Grambo held a FOSS workshop on Levers and Pulleys for teachers. This workshop was held in his classroom from 8:30 AM to 3:00 pm. The teachers worked on the same projects as students in our classroom. Monday, November 3, 2008 - We began work on our Lever experiment beginning on page 48 of Bob. What happens to a lever system if we keep the load and fulcrum in a constant position, but move the effort? In this experiment we use our prior knowledge to solve this problem. The experiment is hand written (except for the graph paper on page 40). The students come up with their own procedure to try and figure out this problem. We talked about variables and how in this experiment we need to control two of the variables (load and fulcrum position). The Sally nature Journal will be collected and graded this week. Thursday, October 30. 2008 - We are continuing with levers. Our goal is to come up with a rule that explains how we can make lifting an object easier or harder to do. We have to make sure everyone took their quiz on force and that everyone brought back their signed Progress Report. Wednesday, October 29, 2008 - We began to play with our equipment and started working at our desks on Levers. We worked in Bob on pages 43, 44 and 45. We noticed that as the load (thing you are lifting) gets closer to the fulcrum (balancing point) it becomes easier and easier for the lift to happen. It appears that some mass must have left the object, but we know it did not. There is some kind of advantage to using the lever; and remember that simple machines help make doing things easier. Tuesday, October 28, 2008 - Today and tomorrow, we have assemblies to introduce the candidates running for Student Government office. Some classes missed science to go to the assemblies. Classes that me today began working on the lever unit. In the beginning of the period, we used a gigantic see saw to lift the teacher. The object was to do this with one hand. Putting a bathroom scale on both sides of the lever, we were able to show that Mr. Grambo's 140 pound force could be lifted with as little as 30 pounds of force. Using smaller equipment, students began to experiment with levers at their workstations. Monday, October 27, 2008 - 6-323 went a trip with Mr. Grambo to Dead Horse Bay. Our goal was to notice how the forest and seashore environments differ from each other. All the classes received a reading on Levers. After being handed in and graded, it will be attached to page 54 of Bob. Thursday, October 23, 2008 - It was Tug*of*War day in sixth grade science. A game of forces that pull in opposite directions. All classes met in Mr. Blum's room. Upon arrival you were issued a sheet that was today's class work and a homework reading on the history of tug*of*war. We picked teams and added their masses. One team went to one side of a two inch thick rope, the other team went to the other side. The rope was twenty feet long. The gym crash mates were there for safety and the games began. We kept track of the force diagrams on the chalkboard. We made predictions and observed the games. At the end we tried to explain the outcomes. In some cases the side with the smaller force won. Wednesday, October 22, 2008 - Mr. Grambo went to the Hospital today. Reallllyyyyy bad headache. Mrs. Vallarella gave 6-419 their quiz on Force. Tuesday, October 21, 2008 - 6-323 had their Force QUIZ today. It took longer than I thought it would. Many children took the entire period to finish it. 6-235 and 6-419 do not have science on Monday, so they finished up bob pages 27, 42 and 35. The sixth grade has a citywide practice ELA test tomorrow, so I will not see two of my classes. Monday, October 20, 2008 - We finished up the definition for Simple Machines on page 27 of Bob. We wrote what we learned about Force onto page 42 of Bob. We made sure we understood Force Diagrams on page 35. We attached stickers to our planner letting everyone know we are having a quiz on Tuesday/Wednesday of this week. Thursday we are playing Tug-of-war in room 315. On Friday we are putting together our Sally notebook. The first Marking Period ends on Friday, October 24. Friday, October 17, 2008 - We made sure that everyone was able to make the Force Diagrams on page 35. We talked about resultant forces and how to draw them as a diagram. 6-416 and 6-419 had their Bob notebooks collected today. We are ready for our quiz on force. It will be given on Tuesday and Wednesday, On Thursday of next week we will be going to Mr. Blum's room to play Tug of War (a game of Forces). Thursday, October 16, 2008 - Everyone was finishing up the section on Force (Bob pages 32, 33, 34 and 35) on page 42 we wrote down what we learned about force. We went back to page 26 and filled in the L of the KWL chart on Force. A force is a push, pull, lift or pressure that uses energy to try to move an object. We add forces that move in the same direction and subtract forces that move in opposite directions. Forces are shown in diagrams as arrows. Gravity is a force on Earth that pulls a mass down toward the center of the Earth. 6-419 has their books collected tomorrow. Next week there will be a Quiz on forces. Wednesday, October 15, 2008 - Some classes began the demonstrations on Pushing with first equal and then unequal forces. Other classes worked at their tables on an experiment that shows pulling with equal and unequal forces. We talked about force diagrams and the Resultant Force. Page 34 of Bob was given for homework. 6-235 handed in their Bob notebooks today. 6-326 will hand in their bob on Wednesday while 6-419 hands in Bob on Friday. Tuesday, October 14, 2008 - We started the period by giving out Progress Reports. Any concerns about the reports were handled at the end of each period. We then went back to page 30 in Bob where we finished up our definition for Force. With our definition in hand, we started the POE Charts on pages 32-35 of Bob. Today we pushed with equal and unequal forces. First we predicted what would happen. During the demonstration we Observed and then Tried to explain what happened. We made force drawings using arrows and learned about resultant forces. Monday, October 13, 2008 - There was no school today in observance of Columbus Day. Progress Reports will be given out tomorrow and Bob notebooks will be collected this week. Friday, October 10, 2008 - We collected all items that were due and that will show up on the Progress Report that will be given out on Tuesday, October 14. 6-419 went over Lab Safety and all the other classes finished up the Bucket Girl activity. Bob notebooks will be collected next week. The school dance and the end of the first marking period will be on October 24. Thursday, October 9, 2008 - The school was closed today in observance of Yom Kippur. Wednesday, October 8, 2008 - We started our unit called Building Big Things today. We began by looking at page 26 and starting the KWL Chart. What do we know about simple machines and what do we want to know or find out about simple machines (We already did a reading from the FOSS book). I want to know how the Egyptians and Romans build things. Stones had to be moved from place to place and lifted. This requires pushes and pulls. We now need to understand the meaning on the word Force. We spent time today on pages 30 and 31 of Bob with our demonstration of Bucket Girl and how we could get the bucket to move. Last weeks reading on Balanced Forces was a big help. All work is due in on Friday. Over the weekend we will be setting up progress reports. Progress reports will be handed out on Tuesday of next week. Your Bob notebook will be collected and graded sometime next week. Tuesday, October 7. 2008 - We went over the four reading assignments to make sure we put the correct type of answer to a how or why question. We receive a yellow sheet to help us label the to of pages in our Bob notebook. We added a sticker to our homework area in the planner stating that all this was to be finished by next Tuesday. Monday, October 6, 2008 - Mr. Grambo will return from Virginia on Tuesday. An assignment on Balanced Forces was left. Please make sure you hand this work to the substitute and make sure you add a journal entry into your Bob notebook on page 20. Friday, October 3, 2008 - Mr. Grambo went to Virginia. An assignment from the FOSS Textbook (pgs 1-4) was left on Simple Machines. This assignment is to be handed in to the substitute and signed by your parent when returned to you. It will then get glued into Bob on page 28-29. Thursday, October 2, 2008 - Mr.Blum and Mr.Grambo went to A OPEX meeting at Floyd Bennett Field. At this meeting we are planning the sixth grade science overnight trips. An assignment was left about how to read a science article. After being graded it will be attached to page 196 of Bob. Our overnight trip to Taconic is scheduled for December 15-18, 2008. Wednesday, October 1, 2008 - There was no school today for the observance of Rosh Hashanah. Tuesday, September 30, 2008 - There was no school today for the observance of Rosh Hashanah. Monday, September 29, 2008 - As we entered the room we picked up some pages for our Bob notebook. This was the beginning of our next unit about Simple Machines. We added information to our Table of Contents (Sketch booklet pg 21 and Building Big Things on page 25) We went to the hallway to write down some important dates into our planner and then back to the science classroom to finish up with Science Lab Safety Rules. These rules went onto page 190 and 191 of Bob. As we left the room we received a homework reading assignment on Lab Safety. after it is grade and returned, it will be attached to page 22 of Bob. Friday, September 26, 2008 - We started the period by checking through the Bob notebook. We looked for parent signatures on pages 187 and 192. We searched for journal entries (Daily Summaries). We then looked at the sketching book. Many students keep forgetting to write their summaries, so we added a journal entry item to our class rules on page 200. It was now time to finish up the Group Games activity with Flip The Mat. In this activity your group started out standing on the brown side of the mat. At the end of the activity you were sanding on the white side. The mat had to be flipped over. This was the CRITERIA for this activity. The CONSTRAINTS were that your feet could not touch the ground. You could not sit on the floor with your feet on the mat. Some teams kept trying to turn the mat over while standing on it - and most succeeded. Some stepped off the mat and onto their bob notebooks (their feet never touched the floor), flipped the mat and got pack on. Others were kneeling on the floor. Everyone heard the words and made inferences as a group. Everyone flipped the mat, some were more creative than others. Our homework was to look over and finish all parts of the booklet on page 21 of Bob. Wednesday, September 24, 2008 - Working as a team is important. We do not always like everyone that we have to work with, but we must learn to tolerate others. We can not always take over a situation or always let others tell us what to do. On pages 16 and 17 of Bob we will work on three group games that teach team building skills. Today we worked on the Hoola Hoop activity (question on the top of page 17) and the Can Pass activity with three questions on page 16. With our hand held together in a circle, we had to move a hoola hoop around the circle of people in our team. When we accomplished this task we tried it sitting on the floor. Our next activity had us passing a can with a ball inside of it from person to person using only our lower body. We learned about Criteria and Constraints. One constraint is that the container nor the ball could fall or touch the floor. On friday, we will continue with the team building games. Tomorrow we will again work on our drawing and sketching skills (page 21 of Bob). Tuesday, September 23, 2008 - Some students do not have science on Mondays, so today those students started the drawing/sketching activity that is on Bob page 21 B and C.
Hypothesis - An opinion or guess based on previous knowledge or clues. On page 187 we wrote a note to our parents that needs to be signed : I understand that my child received a textbook in science. It is to be kept at home. We handed in the Textbook Tour homework Assignment. We looked over Bob pages 192-194. On page 192 we wrote a paragraph explaining how to get a good grade in science. Thursday, September 18, 2008 - We talked about the homework from yesterday. It is not due until Friday, but some students needed help with the textbook scavenger hunt called Textbook Tour. We then worked on the Inference and Hypothesis pages of Bob (10-11). There is a comic strip with a missing panel. Our job is to view the panels we have and then draw in the missing picture. This guess was based on knowledge of the other two drawings. Using clues in the drawings makes this a hypothesis. We started a Think/Pair/Share to make a definition for a new vocabulary word. Wednesday, September 17, 2008 - We went over all the work on Observation Skills found on Bob Notebook pages 6, 7, 8 and 9.
we then received our Science Textbook entitled New York Science-Grade 6 published by Glencoe, a division of McGraw Hill. Each book has a number which we wrote on an index card along with our name, class and title of the book. These cards were collected. We then wrote our name and class inside the front cover of the textbook. We started work on a textbook Scavenger Hunt. The Textbook Tour sheet is due on Friday and is homework. We we get the graded paper back next week we will glue it to pages 18 and 19 of Bob. The tour asks us about copy write dates, page numbers as will as authors names. These books stay home and NOT in the lockers. We will get a sheet to take home over the weekend to get signed about this point. Tuesday, September 16, 2008 - The classes that did not have science on Monday, will work on the Dollar Bill/Observation experiment. During periods 1 and 2, Mr. Grambo went to the garden to start getting it ready for class visits. Picnic tables, to serve as a work area, are being brought out and fence signs are being put into place. The garden is behind the school. You can see it from the hallway windows. Friday, September 12, 2008 - We went over all the pieces of Pages 12-15 of Bob (the procedure writing/tomato sauce pages) and finished typing our e-Mail addresses into the computer. Wednesday, September 10, 2008 - We went over the School Website and how to access files from our science class websites. We used a computer projection system in class today. We talked about being silly on the internet and how to be safe. We then received an Internet Usage Policy which needed to be signed and glued into our Bob notebooks. Tuesday, September 9, 2008 - Every sixth grade class went to the auditorium this morning to listen to the Assistant Principals and Ms. David talk about behavior, what to expect, etc. In class, the students that did not have science on Monday, checked Library Cards and E-Mail addresses. We received a copy of the hours of service for the public library system. We glued this schedule into our planner onto page 12. Monday, September 8, 2008 - Someone at our table checked to see if we brought in our Library Card (from the public library) and to see if we made up our new e-mail address yet. We began to type our e-mail addresses into Mr. Grambo'S computer. We then made sure our notebooks were put together correctly. From now on everyone must have their Bob Notebook in their hand in order to enter the Science Classroom. Thursday, September 4, 2008 - We talked about the Science Class RULES. Parents need to sign the rules. All supplies and signed papers need to be brought in for Friday. Your need e-Mail address and public Library Card are due next Mon/Tues. The Bob notebook needs to be completely numbered (1 to 200) for tomorrow. This is homework. Tuesday/Wednesday - September2 and 3, 2008 - We received a Supply List and talked about what to expect in science for the new year. The Supply List needs to be signed by your parents. Thursday and Friday - August 28 and 29, 2008 The teachers came back to school and had meetings. We also were given time to Fix up our Classrooms.